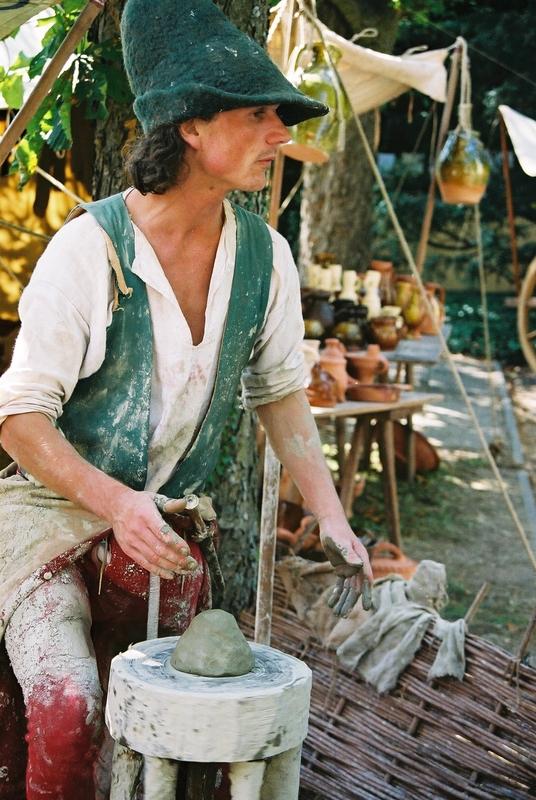 Our first experience with the Original Re-enactors Market proved to be a good selling point. We realized it was going to be a way of meeting interesting people. The stallholders, especially, after the working day we would all get together and relax with a few drinks of historic meads and wines. As I walked around looking and talking to the traders dressed in their colourful costumes, some trimmed with gold brocade and feathered plumes and all manner of lovely jewellery , I was enthralled with the intricate work being carried out. I learned that some of these people worked many hours until early morning in order to make enough of their wares to sell at these events, as well as meet other private commissions. Some people did this as a hobby, others mostly to help make a living. Of course there was always the inevitable charity events on special occasions. These historical shows were usually held on weekends during the summer between April and August and into October. Re enactment battles of the appropriate period of time took place such as ,the Battle of Tewkesbury,or the Battle of Bosworth,also the Battle of Agincourt and many others. Events moved to indoor venues towards Christmas. It was now the month of July and time to prepare for the next outdoor event, this being the Re-enactment of the Battle of Tewkesbury in Gloucestershire. This battle had taken place during the Wars of the Roses in 1455 due to considerable unrest when the houses of Lancaster and York were competing for the throne.. We had been told that this was one of the great re-enactments where there would be many Medieval market stalls that would attract huge crowds of people. This meant that we had to work extremely hard in order to produce sufficient amounts of each of our different sauces, to be able to supply our regular customers, besides enough for our trading stall at Tewkesbury. We arrived at Tewkesbury to find everyone struggling to put up their medieval tents because of the high winds that day, there was much cursing and hammering away at the pegs. Even though these type of tents are pretty heavy the wind was that strong some were being blown away .Of course, being new to the game we had not even thought about acquiring a medieval tent and no one had mentioned it to us. So we felt a little out of place with just an ordinary plastic tent to trade from, we had to make it look as attractive as possible and we felt that we didn’t stand a chance of selling our sauces here, but we had to try. On the open field where the battle was to take place, the knights in their shining armour were practicing their every move ready for when the jousting tournament would begin. Children watched in amazement, chatting to each other, saying they were coming back to see the real thing later on. There were jesters ,jugglers, story tellers, knife throwers, fire-eaters, minstrels, troupers, strolling players and magicians. Some people were playing medieval games such as lawn bowls, archery, wrestling, throwing horseshoes, skittles, and a very interesting game called four seasons chess. In the chess game, each player represented one of the four seasons, also they represented one of the four elements. Green was for spring, blood red for summer, black for autumn, and white for winter. Watching a Knight getting ready for the Battle of Tewkesbury. Most of the traders who were at the previous indoor market were also here, there were many more, however whom we had yet to meet We carried on further around the fields talking to them about their wares while we had the opportunity before the event was due to open, and we had yet to begin setting up our own stall but we still had a little time to spare so we carried on. Just a little further on, we met two charming people selling incense. When Gracia and Pete introduced themselves, I asked what their trade name was. “oh we have an unusual name for our business. We call ourselves Pans Pantry” and proceeded to tell us the story behind the name. Gracia had suggested the name Sorcery but Pete was concerned it sounded to Merlin and magic. After some pondering, he suggested Pans Pantry and it sounded right. After all said Pete, Pan the God of nature, would surely have had a pantry full of all sorts of goodies from the trees and plants around us.” After hearing Gracia’s explanation I agreed it was a wonderful name and summed up their business really well. The exotic smell coming from the incense was delightful, especially the frankincense and myrrh. They also had unique examples from far off lands that intoxicated the senses. Stay tuned for part four There is plenty more to come. We began to display our sauces ready for our first encounter with the grand re-enactment society, not knowing what to expect. Our stall was placed near the entrance where we could see the huge crowds gathering outside waiting to come in. They appeared a little bewildered at the information regarding Roman quisine and banquets. I had placed our posters there to attract attention as they walked in. Anne had certainly given us a good trading position for the weekend. As suggested, we had taken sixty jars of each of our seven varieties of sauces , a total of 420 jars. We thought this number would be ample for our first event. As more and more people walked around the stalls, the place seemed to come alive with all the chattering and bartering amongst stallholders and their customers. Some of the public were also dressed in Roman and Medieval costumes while others wore 16th to 18th century costumes. We could see that many of the public were regular visitors at these events and took it very seriously. We had placed a few open jars on our stall for people to taste as we had at the museums, hoping it would prove as successful. To our delight, we watched their expressions beginning with apprehension followed by comments of, ” Wow ! that tastes wonderful and so different, what’s in it?” . There are many herbs and spices added to give that unique flavour,” I replied . Throughout the day after people had tasted the varying flavours. Some wanted the Medieval, others wanted the Roman or Saxon sauces. During the lunch break I was amazed to see people using it with the meal they had purchased, a modern day sausage roll or hamburger. Many who had already purchased our sauces came back the following day for several more to take back to their friends and family who were unable to attend the event. 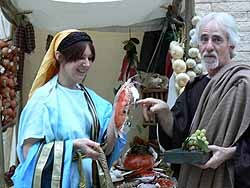 Then there were the customers who had read the information about the Romans food at the entrance. 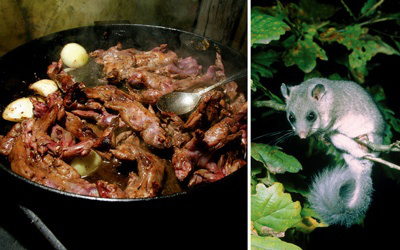 They asked the usual question about the dormice. Of course I assured them that it was not one of the ingredients in our product. During the first day, I took a walk around some of the stalls to introduce myself, leaving John to continue serving on our stall. I aimed for the traders I had first noticed setting up their stall. 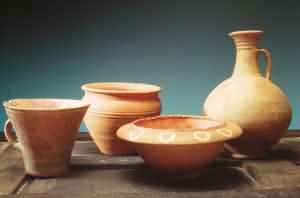 They were Jim Newboult and his wife Emma who made and sold wonderful replica vessels ranging from the Roman times to Medieval and later. Jim had in fact demonstrated his work on the television series, “Time Team” and his replicas are so authentic that they are sometimes commissioned for period films. I have bought several pieces from Jim myself; I was always fascinated to watch him stack his pottery so high. It was amazing that none of them came tumbling down as some of them were huge examples he made of Roman amphorae,mortaria, flagons ,dishes pitchers and cauldrons. There were beautiful delft plates, mugs candle sticks and many other items from other historical periods of times gone by. He certainly had the knack of stacking his wares. 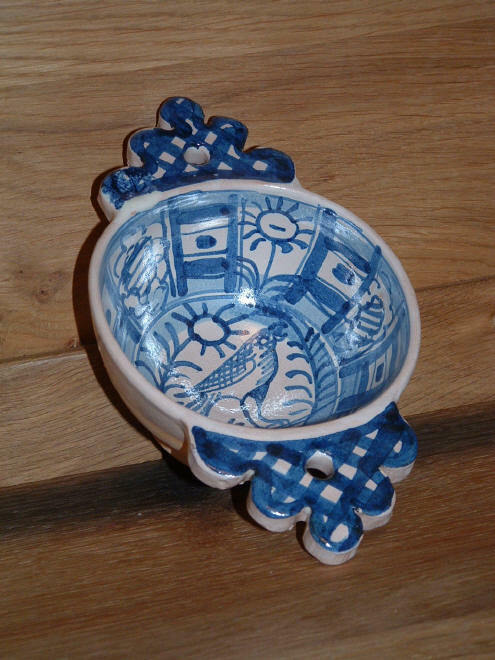 Delft Ware Porringer 16th/Early 17th century. 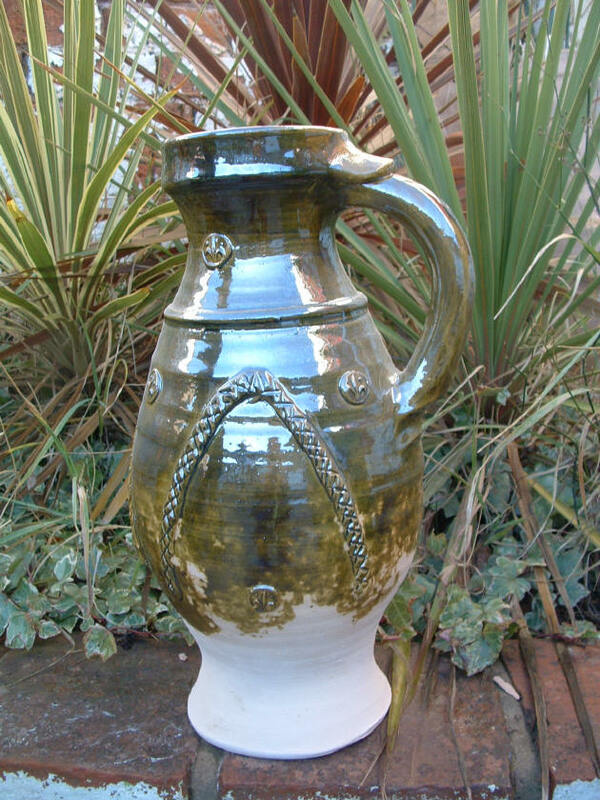 Medieval Green Glazed Jug Replica. It seems ages since I was busy producing sauces from original roman recipes. These recipes were from the Apicius Cookery Book, the only evidence of cooking handed down to us from the days of the Rome Empire. Initially I began lecturing to school children between the age of 8-12yrs old about roman pottery, then decided to organize an open day to demonstrate to the children what the pots were used for. I then proceeded to make my first Apicius sauce which was to use with chicken. The feedback from the children was excellent and the history teacher suggested I produce my sauces for sale to the public. This involved further research but was accepted by many museums and historical houses as a gift item. In a word, it was a specialized item and not for super market shelves. It was hard work at first, especially filling jars by hand but I purchased a filling machine once I could afford it. 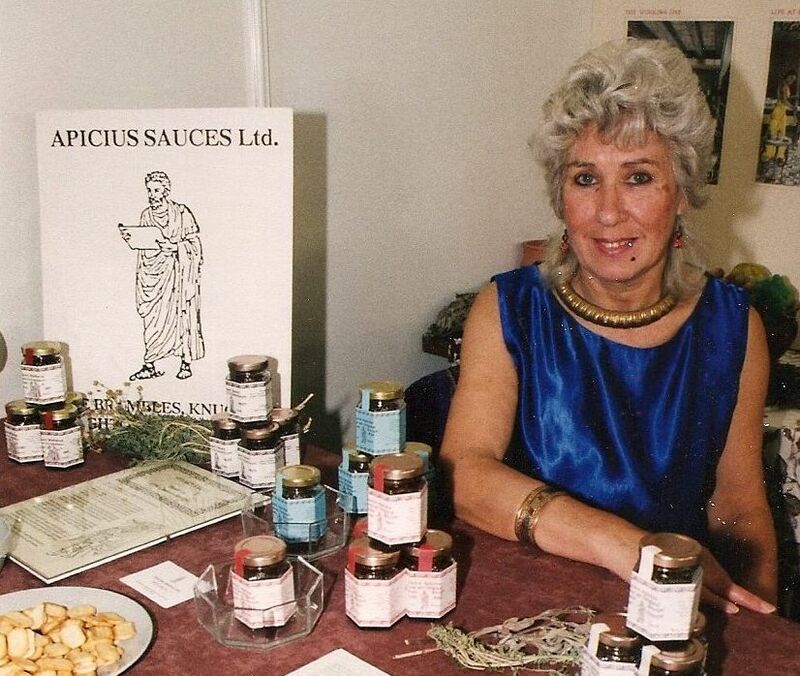 I had five different varieties of Apicius roman sauces and were then asked to produce sauces from Medieval recipes so things were really busy. The next part I am going to talk about is the exciting part of the whole enterprise. THE THRILL OF THE RE-ENACTORS. 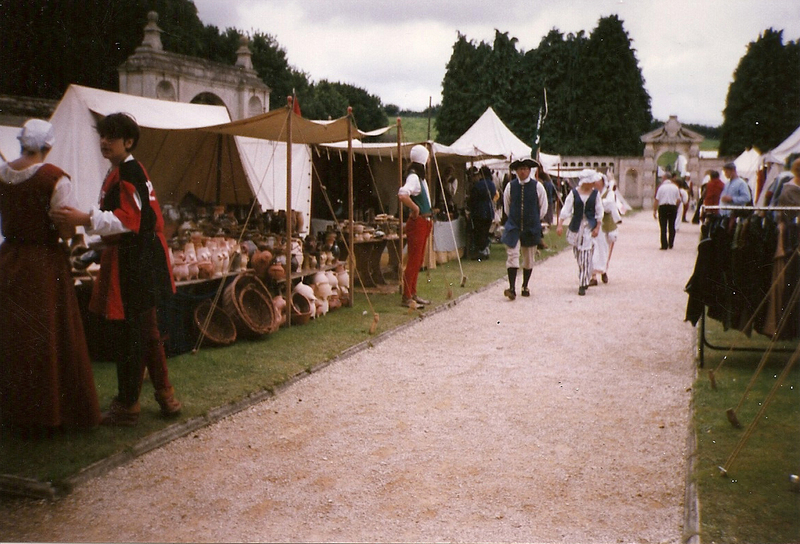 One weekend we were invited to one of the Sealed Knott Society’s re-enactment battle displays. They were staging the Battle of Mortimer’s Cross in Herefordshire. The battle was fought near the spot during the Civil Wars between the houses of York and Lancaster on the 2nd of February 146l. The forces of Edward Mortimer, the Earl of March, and afterwards Edward the fourth, on the side of York and those of Henry V1 , on the Lancaster side, had met here to do battle. There were several smallholders at this event displaying reproduction suits of armour and various items of weaponry. Some of the re-enactors made their own armour for the battles they took part in. 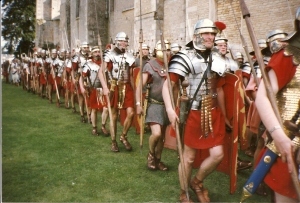 It was whilst talking to one of the re-enactors after the battle, I asked if it would be possible to aquire a stall at the next historical event to sell our Apicius sauces. I was told that we would have to become members of the Sealed Knott Society and would have to pay. However, the gentleman who organized their stalls advised us to get in touch with the owner of The Original Re-Enactors Market in Oxford which I did and was immediately accepted and given a stall to display our sauces. At the time I was not aware of how huge this re-enactors organization was until the organizer whose name is Anne, explained that they are held in all parts of England, Wales, Scotland and France, and that people from all over the world attend these events.I was certainly looking forward to our first encounter and hoping to do business with so many people attending this re-enactment battle. My partner and I arrived at Abingdon, Oxford with our caravan loaded with several trays of neatly labeled Roman and Medieval sauces. We were then told to park the caravan and Anne would meet us in the main hall where the market stalls were being set up for the weekend event . Of course we were new to this game and hadn’t got a clue, but were soon told to first collect a couple of trestle tables and if we had thought to bring suitable material to cover the trestles that would be fine., fortunately we had !. 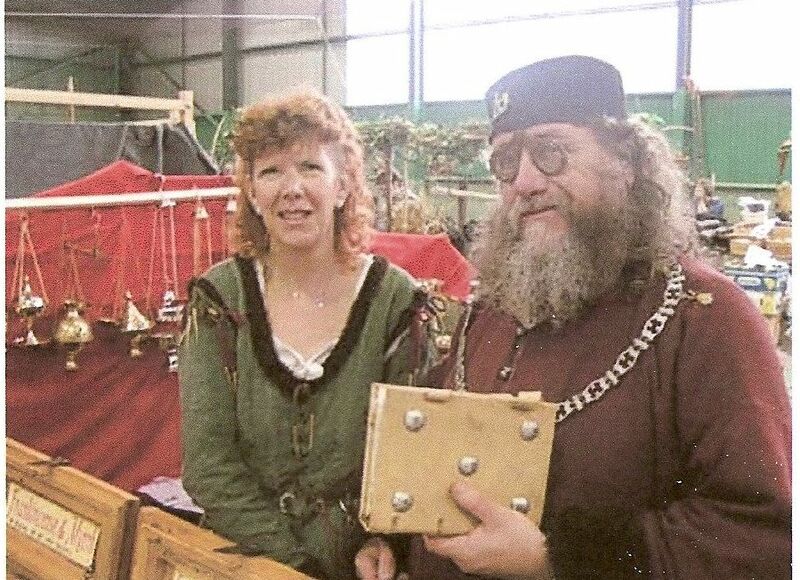 Anne suggested we arrange our stall near the entrance where everyone, meaning the usual dedicated people who visit the re-enactment events, would see our stall on arrival and would also know it was a new addition to the market stalls. Whilst we were setting up our stall we watched the huge hall being transformed to times past. It was beginning to get really exciting. Everyone was dressed in the period costume they were representing. Some of the stalls were magnificent, some double and treble the size than that we were to trade from because they were selling large items. Huge travelling chests and four poster beds were among the goods for sale, these would have been used between the 15th and 18th Century There were refectory tables, farthingale type chairs, huge cabinets even rocking horses. Quite a number of these items were hired for period films and television today. 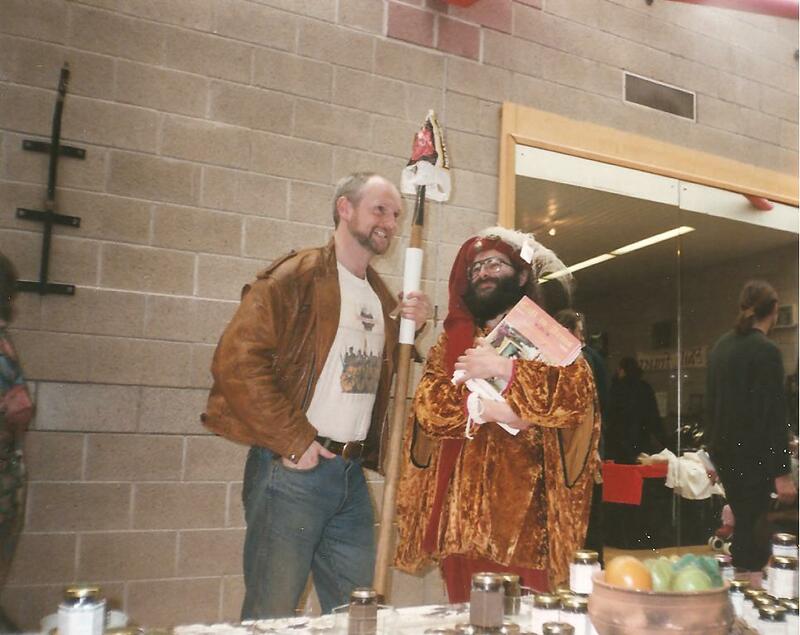 Re enactor Duke Henry Plantagenet, talking to an enthusiastic customer who eventually bought several of our Roman sauces. 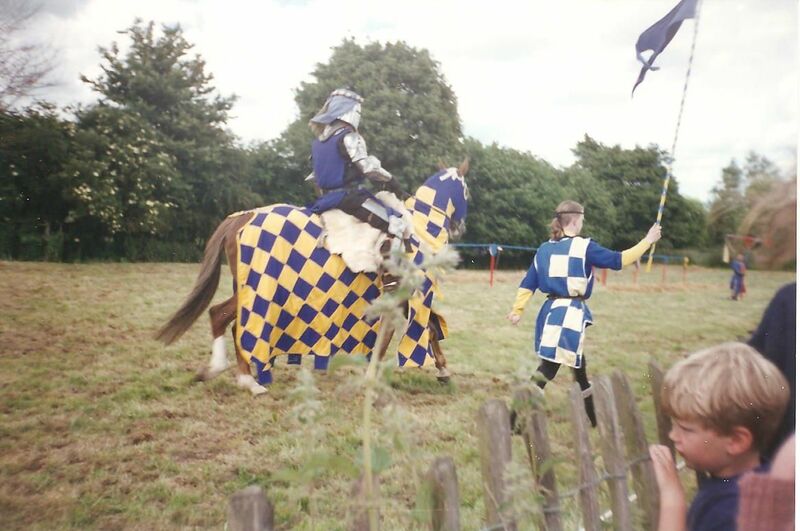 Me at one of my first Re-enactment venue’s. 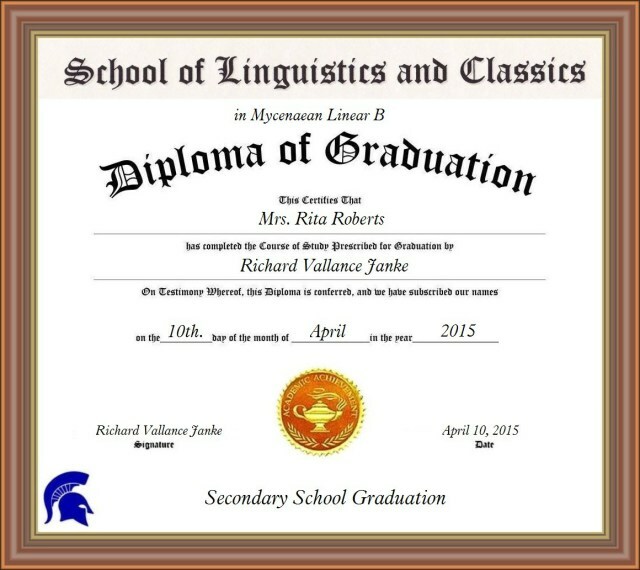 I became more professional as time went on. But business was going well. Stay tuned for the second part of this post . There is much more excitement to come. Family looking for broken sewer pipe finds 2,500 years of history. Fascinating history for me. I Hope my fellow bloggers also enjoy this post.